R.A. Mihailoff is an actor and producer, known for Leatherface: Texas Chainsaw Massacre III (1990), License to Drive (1988) and Slasher.com (2017). R.A. Mihailoff will be appearing at Frightmare In The Falls both days. Barbara Crampton was born on December 27, 1958 in Levittown, New York. Growing up in Vermont, she spent the majority of her childhood summers traveling the country with a roadside carnival that her father worked for. Crampton began acting in school plays in seventh grade and subsequently studied drama in high school. She earned a BA in Theater Arts from Castleton State College and, following graduation, portrayed “Cordelia” in an American Theater of Actors production of “King Lear” in New York. The young actress then moved to Los Angeles and, in 1983, made her TV debut with a recurring role on the popular daytime soap opera Days of Our Lives (1965). The following year she had a brief, but memorable role in Brian De Palma’s Body Double (1984), which was followed by the 1985 comedy Fraternity Vacation (1985). Barbara achieved enduring cult popularity as college coed Megan Halsey in Stuart Gordon’s Re-Animator (1985) and, after making a splash in the horror genre, successively starred in From Beyond (1986), Chopping Mall (1986), Puppetmaster (1989), and Castle Freak (1995), among others. Outside of horror, Barbara had recurring roles on daytime television soap operas Guiding Light (1952); The Bold and the Beautiful (1987), and The Young and the Restless (1973), for which won a Soap Opera Digest Award. Years after retiring from acting to raise a family, Crampton returned to film in 2011 with a role in Adam Wingard’s You’re Next (2011). She subsequently appeared in number of new films, the majority of which were horror. Highlights of her return include The Lords of Salem (2012), We Are Still Here (2015), and Beyond the Gates (2016). Barbara Crampton will be appearing at Frightmare In The Falls both days. Barbara Linnea Quigley was born in Davenport, Iowa, on May 27, 1958 to Heath and Dorothy Quigley. Her Mother was a housewife and her Father a noted Chiropractor and psychologist. After moving with her family to Los Angeles in the late 1970s, the short, petite Linnea began working at a Jack Lalanne Spa. There she was encouraged to try modeling and acting. She soon began getting small parts in commercials and B-movies, such as “Stone Cold Dead” (1979) and “Wheeler” (1975). Her breakout role was in “The Return of the Living Dead” (1985), which has gone on to become a cult classic, and established her firmly as “Queen of the Bs”. Her reign was supreme in the late 1980s with such films as “Sorority Babes in the Slimeball Bowl-O-Rama” (1988), “Night of the Demons (1988), and “Hollywood Chainsaw Hookers” (1988) In 2001 Linnea moved to Florida to be closer to her ailing parents who had settled there after her father retired. As of this writing she resides in south Florida with her beloved dogs. She is a devoted animal rights advocate, and also leads a strict Vegan lifestyle. Linnea continues to appear in, and produce films. She also appears at Horror Conventions around the globe, where she is a fan favorite. She has written two books about her life in the B-movie industry, “Bio & Chainsaw,” in 1992 and “I’m Screaming as Fast as I Can” in 1995. After more than 35 years and more than 125 films, Linnea Quigley is still “America’s Scream Queen”. Linnea will be appearing Saturday and Sunday at Frightmare In The Falls 2019. Late 1970s horror genre icon who’s best known for his creepy performance as “Pluto” in the uncompromising Wes Craven horror film The Hills Have Eyes (1977). Berryman (who suffers from Hypohidrotic Ectodermal Dysplasia, a rare condition leaving him with no sweat glands, hair, fingernails or teeth) reminds one of a latter-day Rondo Hatton who also suffered from a rare medical condition that distorted his features giving him a brutish look just right for horror movies. To Berryman’s credit, he managed to develop upon his “Pluto” character, and has turned up in numerous sci-fi / fantasy movies such as My Science Project (1985), Weird Science (1985), Armed Response (1986) and Evil Spirits (1990). The tall & lean Berryman generally portrays mutant bikers, evil undertakers, monsters and other frightening characters! A genuine favorite of horror movie fans. Michael Berryman will be appearing at Frightmare In The Falls both days. William “Bill” Moseley (born November 11, 1951) is an American film actor and musician who has starred in a number of cult classic horror films, including House of 1000 Corpses (2003), Repo! The Genetic Opera (2008) and The Devil’s Rejects (2005). His first big role was in The Texas Chainsaw Massacre 2 (1986) as Chop Top. On the HBO TV series Carnivàle (2003), Moseley had a recurring role as camp cook Possum. He has also released records with guitarist Buckethead in the band Cornbugs, as well as featuring on the guitarist’s solo work. Bill Moseley will be appearing at Frightmare In The Falls both days. YOUNG STANLEY URIS IS COMING TO NIAGARA! As a young person living in Vancouver, Canada, it was easy for Ben to explore the thriving film scene as a background player. That interest led to his first audition, which was for the role of Young Stan in Stephen King’s IT. Studying the art of acting remained a passion in his life, while at the same time testing the waters with different career options. Currently, Ben is a Product Engineer at a tech company he has been with for 14 years. Thoughts of returning to acting are never too far from his mind. Ben Heller will be appearing both days.  RUE MORGUE EDITOR JOINS FRIGHTMARE! Andrea Subissati is Executive Editor of RUE MORGUE magazine, co-host and producer of THE FACULTY OF HORROR podcast and co-curator of the Toronto-based horror lecture series THE BLACK MUSEUM, which she founded with Paul Corupe. She appeared in TV horror documentary Why Horror? and her writings have appeared in The Canadian Horror Film: Terror of the Soul; Yuletide Terror: Christmas Horror on Film and Television; and The Undead and Theology. Andrea will be appearing both days at the Rue Morgue booth and at select panels throughout the weekend. CULT ACTOR JOINS THE LIST! Tom Atkins is best known for his work within the horror and science fiction genres. He starred in two films directed by John Carpenter: the 1980 ghost story The Fog and the 1981 science fiction thriller Escape From New York. His next role (this time a leading role) was the third installment of the Halloween franchise, the Carpenter-produced Halloween III: Season of the Witch. He completed further work with George A. Romero, appearing in three of the director’s projects: the anthology Creepshow; the anthology Two Evil Eyes; and Bruiser. He portrayed Detective Ray Cameron in the 1986 cult horror film Night of the Creeps, and also had a lead role in Maniac Cop. Atkins has continued to act in both the thriller and police procedural genre and is well known to movie goers for his roles in Lethal Weapon, Striking Distance, and both the film and tv versions of the Rockford Files. Recently he had supporting roles in the remake My Bloody Valentine 3D and Drive Angry. Tom Atkins will be appearing both days. Zombieinfo is your source for everything horror!